“Comparative oncology - the study of cancer treatments in multiple species - has the potential to deliver tremendous medical advances" - Dr Timothy Fan. US researchers are conducting a study into whether a dog’s immune system could be stimulated to eliminate osteosarcoma. The team at the University of Illinois College of Veterinary Medicine hope their findings could lead to advances in not only treating canine patients but children too. Osteosarcoma is a highly aggressive, malignant bone tumour that most often occurs in one of the limbs. 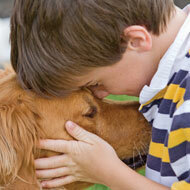 The disease affects around 10,000 dogs each year in the US, most of which are large or giant breeds. Current treatment options for canine osteosarcoma are radiation, amputation, chemotherapy or a combination of these methods. The veterinary surgeon works with the owner to design a treatment plan, tailored to the individual, that focuses on quality of life. In the study, the team will assess a treatment method that combines an immunostimulatory molecule called CPG ODN - a molecule that has already shown promise as a component of cancer vaccines - with high-precision radiation. The study will take place in three parts, looking first at a cell model, then a mouse model to see how the CPG molecule works in real animals. The findings from these studies will then be used to develop treatments for a small pilot study involving dogs. “Comparative oncology - the study of cancer treatments in multiple species - has the potential to deliver tremendous medical advances,” Dr Fan continues. “This field is exploding.